This fully comprehensive Holiday Budget Workbook is the perfect tool for any family to organize their finances and have the best holiday this year. Nothing can be more time-consuming than holiday shopping, but it’s all worth it to have that special day with your family and friends. To make everything just the way you want it, the Holiday Budget template helps you work through all the financial information, so you can get to that important day, stress-free! By simply entering in a few pieces of information, you’ll have a complete overview of your holiday expenses this year, giving you the tools needed to plan the perfect holiday with your loved ones. Start by downloading the free file below by clicking the link provided. Once you have successfully downloaded the template click on the “Holiday Gift Budget” tab to begin. 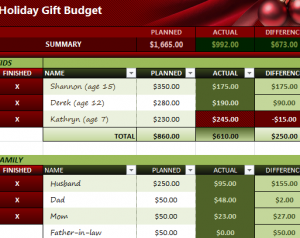 First, enter your planned budget at the top of the screen, in the box under “Planned”. This will allow you to track your expenses and it will instantly inform you if you have deviated from your target budget. The template has been broken down into different categories, such as kids, family, friends, and co-workers. However, you can easily change any of these pre-written examples to whatever suits you best. If you want to make a section for travel expenses, for example, just click in the box you wish to change and start typing in your new information. The “Gift List” tab is a more comprehensive list of the specific gifts you bought and allows you to check off your shopping list as you go. In this section, you will enter all the information about your gifts, such as the price and store location, and have that information readily available if a problem were to occur. After you have gone through and replaced all the pre-written examples, the template will automatically calculate the totals for you and compare that number with your budget at the top of the page.